Since 1935, the first Sunday in August has been celebrated in the U.S. as Friendship Day, a day to nurture relationships, new and old. So, as a gesture to friends who are also professional colleagues, we invite you to share this special offer. 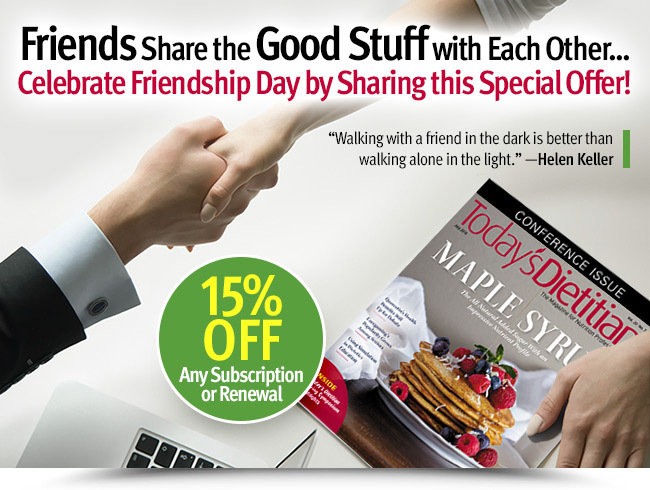 Now through Tuesday, you and your friends can get 15% OFF any subscription to Today's Dietitian. Pass this email on to any friend you'd like so they can click the link to our special Friendship Day subscription page. So, on this special day, appreciate your friends a little more than usual and share something good from your friends at Today's Dietitian. Offer expires on Tuesday, August 7, 2018, at 11:59 PM EDT.